Note 1: The distances below were measured by car odometer and may not agree exactly with another car's odometer - due to various factors including tyre wear it could vary by 10%. Resetting the odometer at known positions eliminates the accumulated mileage error. Drive North on Kifissias Ave., filter RIGHT onto Katahaki street (be careful not go straight under the underpass), continue on Katahaki crossing Mesogian Ave. Filter right and join the Attiki Odos motorway (this section is called the Immitos Ring as it circles Mount Immitos). 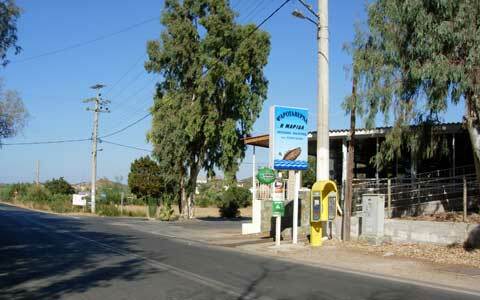 When it joins the main Attiki Odos motorway, take the Markopoulo direction. - At 150 m pass a small roundabout on your left (turning left at the roundabout would take you to the marina & seafront). 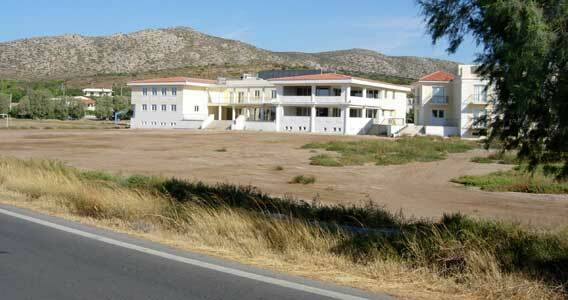 - At 8.6 Km pass the turnoff for the Temple of Poseidon at Sounio on the left. 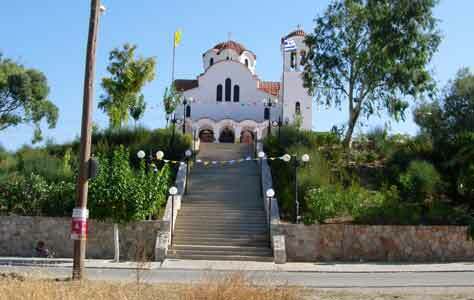 - At 12.35 Km pass the church called Panagia Eleousa on the right-hand side of Leoforos Theseos. The large EU administrative building in Legrena. The sea & beach is to the left-hand side of the road. The Panagia Eleousa church in Legrena on Theseos Avenue. (The only church in Legrena). Reset your Odometer here for the journey to Aghios Konstadinos!